96 x 96 x 8 in. Linear translation consists of a black string extended from the page of a book, for example, The Name of the Rose, by Umberto Eco onto a wall. The length of the string is the total length of all the black type in the book. The length of the string represents the actual distance the eye traverses in reading the book; first reading from left to right, then doubling back. The white string represents the sum total of all the blank areas around the text, less the printed text the eye scans. 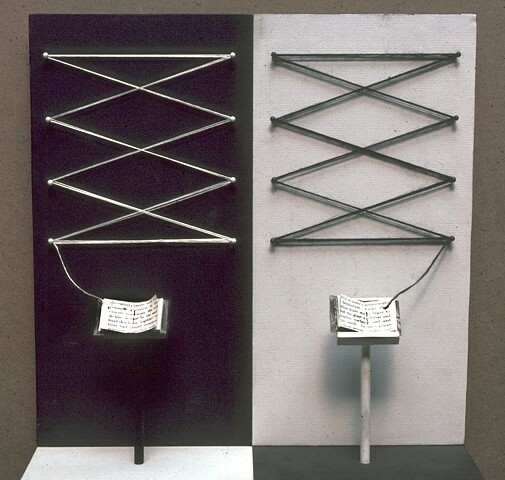 Two identical books sit on stands with the black string attached to the last word in the book and the white string is attached to the last page of the book with blank space. In addition, theres a list a various novels, telephone directories and dictionaries, for example with their calculated totals of black and white string representing the length and space the eye travels in reading a book.